Dr. Stegen has been practicing in the Upper Valley since 1992. He is Board Certified by the American Board of Optometry, one of very few Board Certified optometrists in the Upper Valley. Born and raised in New Jersey, Dr. Stegen attended Rutgers University, receiving his Bachelor’s degree in Biology. He then attended Rutgers’ Graduate School at New Brunswick (N.J.) where he worked on a Master’s Degree in zoology and physiology while teaching undergraduate students in Comparative Anatomy and other courses. 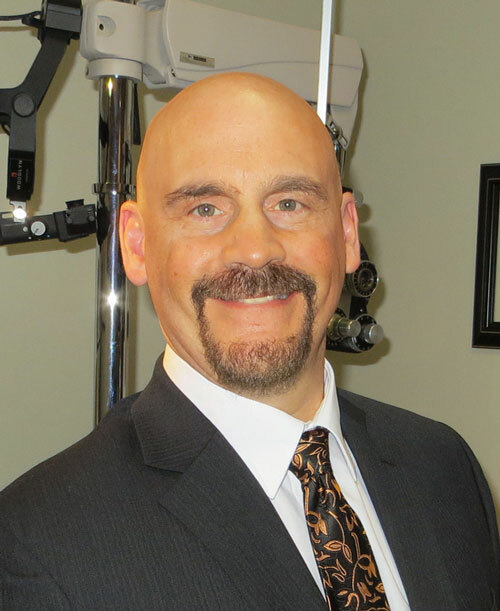 Dr. Stegen received his doctorate in optometry from the Pennsylvania College of Optometry in Philadelphia, Pennsylvania in 1990, where he also instructed optometry students in Gross Anatomy. After graduation, he performed a residency in hospital-based optometry in the Veterans Administration Medical Center at Lyons, New Jersey. He moved to New Hampshire and began practicing in Keene and West Lebanon in 1992. On January 1, 2011, Dr. Stegen assumed ownership of the optometry practice of Pro Optical, forming North Country Eye Care Associates. In June 2018, Dr. Stegen moved North Country Eye Care Associates to its current location in the Shaw’s Benning Street Plaza, just across Rt. 12A from its previous location. The new office includes a full-service optical shop. Currently, Dr. Stegen practices general optometry, with special interests in contact lenses and laser vision correction. He is a member of the American Optometric Association and is a former member of the Board of Directors of the New Hampshire Optometric Association and a current member of the Canaan Lions Club. In his spare time, Dr. Stegen enjoys playing hockey, skiing, hiking, cycling and woodworking.